Once upon a time, clothing designers created designs, sourced materials, and created products that were then mass manufactured and distributed—a process that could take anywhere from months to years. But that’s not the story any longer. Today’s fashion industry is driven by consumer demand for “fast fashion,” complete with turnaround times of two weeks or less, penalties for carrying excess or outdated inventory, and consumers who want their products immediately, if not sooner. More-efficient distribution center (DC) picking. If you’re a retailer that sells products via brick and mortar stores, online or via both channels, are you maximizing your DC footprint or optimizing your dimensional space, so most products flow through with minimal reserve inventory storage or other bottlenecks? For many companies, there’s a distinct benefit to moving a step beyond traditional shelving and bins. If you’re considering your next move in optimizing a single DC or your portfolio of DCs--or building an auxiliary space ideal for e-commerce inventory—a UNEX SpeedCell Storage Solution provides a high capacity, high-density storage solution for low- to medium-velocity products. This is ideal for enabling better flow through fulfillment and ultimately growth in your product lines. Flexibility for better in-store and DC order picking. The mobile UNEX SpeedCartt helps your pickers to speed order picking. Each cell holds a separate SKU, so pickers fly through the store backroom or distribution center, able to pick orders more accurately with less travel. A fast, modular picking cart helps to supplement order fulfillment, restocking, seasonal demands and more. 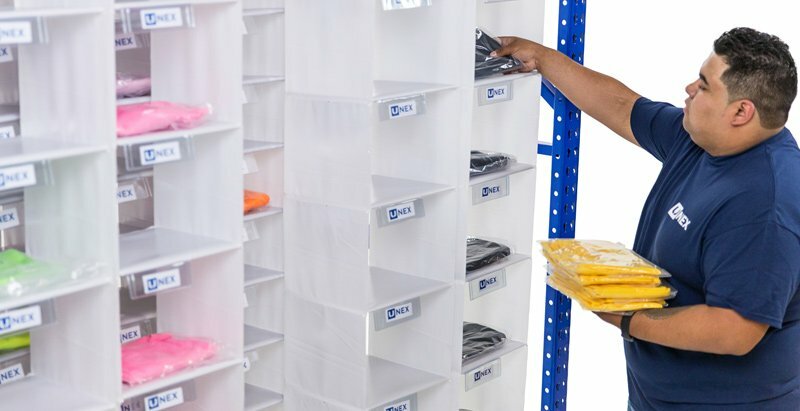 Configurable for either single-sided or back-to-back storage, this well-designed product allows greater SKU availability than individual boxes and bins, using a proprietary design made from durable, lightweight textile for flexibility, durability, safety assurance and long-term usability. While constructed to provide superior flexibility in most order picking or piece-work circumstances, custom solutions are available. UNEX SpeedCell Storage Solutions serve both large and small businesses in a wide range of industries. Is your business looking to reduce travel and pick times while picking orders and restocking inventory? SpeedCell compresses 200′ of rack or shelving into 40′ of highly organized space, for more pick facings and greater SKU density. UNEX SpeedCartt speeds fulfillment processes and gets orders out the door as fast as possible. Contact your UNEX Pickologists today.